I offer to thee on this month of festivities a tale of caution. Ebenezer Scrooge was grumpy the day before Christmas. However, that night, he was visited by a 301 intern. He warned Scrooge to change his ways, or face the consequences. If he did not, he would be visited by three ghosts. That night, he sat alone in his room, studying. However, he was interrupted by a ghostly apparition. “I am the ghost of 301 Christmas Past, and I am here to show you why you are like this!”. Ebenezer and the ghost travelled to the past, and Scrooge saw his younger self completing an exam. Nobody within the vision noticed him, and so they could walk up to his exam paper once he had left, and check his answers. Scrooge looked in admiration of his younger self’s work. “Bah humbug! Away with you!”. The ghost dissipated, and Scrooge tried to go back to studying. However, he was distracted by thoughts of ghost as he was struggling with his work. An hour passed, and then a further ghost appeared. “The only celebration I need is success in my exams! I just have to work through some things I’m struggling with, and then I’ll enjoy a great big dinner tomorrow”. They transported to another area of town. Here, 301 Intern Tim was celebrating Christmas Eve with his father. “Look Scrooge, see the jolliness of 301 Intern Tim! Christmas is exam season for him too, yet look at him gallivanting! He has been to 301 Workshops, and even though he has never done a presentation before, he can now rest happily and enjoy his holiday season – bearing in mind he has the skills to succeed when his presentation comes”. Scrooge was having none of it. The ghost disappeared. It was now 4AM, and Ebenezer Scrooge was still revising. “Curse it! It is now 4AM, and my procrastination about A Christmas Carol has led me to stay up all night! I hardly have enough energy to enjoy tomorrow! How on earth will I cope? My presentation is due early next semester!”. But then a shining light appeared upon him. And change his ways he did. He was able to book onto a workshop there and then, and the morning after (knowing full well he would acquire the skills needed to tackle his exam in due course) he managed to enjoy a Christmas Dinner with all his family and friends. The End. Merry Christmas and a Happy New Year from the Entire 301 Team! The purpose of the 301 centre is to support students in developing the necessary academic skills for their studies at university. The university recognises that no student comes to the university perfectly skilled at writing, critical thinking, presenting etc. However, teaching the necessary subject knowledge for a course leaves little time for students to get real practise at essay writing or presenting until they’re being evaluated on these things. It’s easy for even very gifted students to fall through the cracks and not reach their full potential. This is of course where 301 comes in. Workshops are designed to teach specific techniques and skills for things like exam revision or mind-mapping. If they aren’t specific enough, one to one support can be given with tutors helping students with their personal academic problems. Of course, most students don’t attend a single workshop, even though they’re absolutely free. Perhaps you’re one of these people. They do so for many reasons, I know that before I worked here I only took two. I would hypothesize that one reason is that, unless they’re obviously struggling, many think they have enough on their plate already, and are doing just fine as it is. Why bother if there is no problem to solve? I would like to suggest that even if you’re one of these students, you should come anyway. Not just because you can hone your skills even further, pushing up your academic performance, but because of the importance of these skills beyond academia. Let’s take some examples workshops, and see how they could apply to different job roles. This workshop teaches you how to really engage with a text or argument. The arguments and points in texts can be difficult to understand, much less refute or critically analyse. Yet this skill is incredibly useful in most careers, even those which do not usually require reading complex texts or making arguments. This is a highly valued skill in careers where you might have to writing funding or permit applications, writing letters to clients or superiors, or even just deciding with colleagues what the next step in a plan should be. Thought your note-taking days were over once you left university? Think again. Practically every job will require you to take notes at some point. Whether you’re in a meeting on an important subject or just taking case-notes for a client or customer. Accurate, relevant note taking using established and efficient techniques taught in this workshop can make your notes extremely useful, rather than some jumbled, confusing mess. Take this workshop and you’ll save yourself a thousand headaches in the future. Your co-workers will thank you too! Who doesn’t need help avoiding procrastinating! The more time spent procrastinating at work is the more stress trying to quickly complete tasks later down the line. Being able to get in the ‘zone’ and really get work done will not only make you better at your job, but improve your mental health. You’ll find this useful in your leisure time as well. Avoid the distractions of YouTube and social media to make the most out of your time off and complete some of your hobbies and passions. As well as all the chores. This workshop focuses on guided reflection on your work at university, identifying weaknesses and mistakes made as well as what went well! A reflective person is not only able to sell themselves better to potential clients and employers, but also better placed to improve themselves over time. Also beware, a lot of companies are requiring their employees to reflect regularly on their progress, so might as well get used to doing it productively now, because it will be a mainstay of your work life! I know what you’re thinking, how the hell will you use revision techniques once you’ve taken your last exam! I know when I took my last one I breathed a sigh of relief. But of course, then I started applying for jobs and being given small examinations, being made to give presentations and generally being asked to demonstrate those same skills of memory, relevant and succinct answers, etc. Also, don’t forget, you might think this is the last exam of your life, but who knows where your life may go. You might have to take an additional qualification to move up the career ladder, or perhaps one day you’ll change profession and have to retrain, while having all the worries of adult life to deal with. The skills of being able to keep calm under pressure and remember useful information are good skills to have. Look at all these skills you can get for free! What’s more, if you do enough of them you can get a study skills certificate in that area, which goes on your H.E.A.R. This means that employers can see real, paper proof that you have been trained in these skills, which in the current job market could be the difference between getting that all important interview and being passed over. For more information on exactly how the study skills certificates function. Click here. While in University, you are focused on learning everything about your course and doing your best in exams and assignments. Beside all the academic skills you learn from your course, there are plenty of other resources in the university to help you improve your skills or learn new ones. The University of Sheffield has many services and resources from where you can learn something new. One of these services is the Skills Resource Bank! The 301 Skills Resource Bank provides online materials and recommendations related to what you are interested in. You can use it to search for opportunities that relate to the skills or attributes you want to improve. 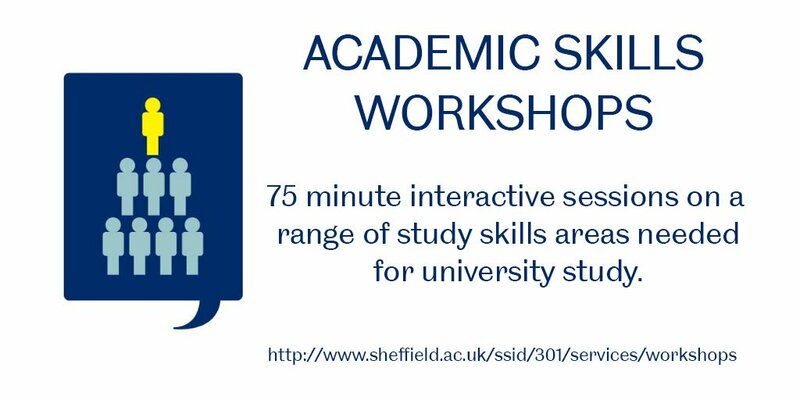 or you can access it from the 301 website under the Study Skills menu option, scroll down the page to the Not sure where to start? section and click Skills Resource Bank. The Skills Resource Bank allows you to choose between 3 categories: Everyday, Academic, and Professional. Choose the one that best describes what you are looking for. If none of these seem to match, you can choose the Customise option. After you’ve chosen the category, you can search and filter based on more specific details about what you are looking for. You can choose the skill category, the faculty you are part of, what type of material you are looking for, or the service you would like to use. This will give you a list of workshops or online services that can help you improve your skills. If you don’t know what you would like to learn, you can have a look through the different search categories and you might find something that interests you. You can try it out by clicking here. The first semester will nearly come to the end. You might have or will have been bombarded with a horrible number of academic assignments or exams, hence needing to start thinking about how to organise your time and energy on handling such intensive workload. I have experienced the same situation as you do where I had to submit five or six different assignments at almost the same time. Today, I will give you some useful tips that you might think useful to your study in your case as well. Effectively managing your time is absolutely of paramount importance, particularly as you are facing quite a lot tasks to do at the meantime. Firstly, I strongly recommend you to note all your tasks down on your computer and get them highly prioritised at different levels. The best way to do this is to use the system-embedded software on your computer, the most efficient ones of which probably is the ‘To-do’ applications or ‘Calendar’ combined with the ‘reminding’ function of your device, listing all the assignments you have, dissecting each assignment into different tasks and prioritising these tasks based on how important and urgent they are. Secondly, please bear in mind that it is critical for you to reflect upon the potential associations between your assignments, so that you can have a better clue in your mind what tasks (that might be from different modules) can be highly prioritised together and what can be less. For example, you may realise that there is something overlapped across different modules at some point of the knowledge. You can then consider addressing this point of the knowledge first before doing the rest of the tasks even if this point may have different requirements in different modules. Thirdly, take the actions and get them completed as soon as possible. Please never drag on your action to the last minute, i.e. the deadline. In order to guarantee the quality of your assignment, you should leave sufficient time for yourself to self-diagnose what you have done so far and think over how you make further progress. I suggest you leaving around a week time away to your completion before your submit for each module. If you would like to have more advice and tips to for your time management skills, I highly recommend you to have a look at the 301 academic study skills workshop ‘Managing your time and avoiding distractions’ where you will learn some skills about enhancing your efficiency, beating procrastination and managing your time effectively. You can click on the link below to book your position. As the Christmas Holiday is approaching, a lot of workshops are already closed. As such, you may wanna come to one in the next semester. I believe you must have been bombarded with many tasks in your study which involve intensive reading practices, or you might face with a situation where reading is absolutely necessary at the first place before taking an action on your actual assignments or essays. If you need to do a lot reading, you must need to think about how you speed up your reading speed; otherwise, your efficiency cannot be guaranteed. I was recommended with an approach of empowering my reading techniques when I was facing to many assignments at the same time. Not only did this approach help speed up my reading pace, but also allowed me to root what I had learned in my mind. The first step is to get your reading materials ready in your hands. You should make clear in your mind exactly what you are going to read beforehand. If you like reading paper-based documents, print all of them out and categorise them into different file stacks. If you prefer reading on a device, you can create different folders and download the documents you need into the folders. Your categorisation of the reading materials might be based upon different themes of a particular topic or upon exactly different tasks you need to fulfil. Whatever way it is, you should also figure out the potential relationships between them as their might be some overlapping knowledge coverage. Then you will need to think about your reading technique. For some reading materials, I believe you should read all the text particularly when the material is very important. Whereas for some other materials, you might just need to extract some useful points of knowledge as reference without needing to read through the entire material. For the former, I believe a good way is to constantly direct yourself back to the introduction or background part of the document as you read because this part typically talks about the aim and objectives of the document, so that you won’t lose the main focus of what this document really tells. Regarding the latter, be sure you definitely do not ignore the sections that explicitly tell about the exclusive outcome that is regarded as the true value of this document; this typically takes place at the abstract, the end of introduction or the conclusion sections. You then need to write down some notes from your reading. Do not just simply read without taking any notes down to get yourself more familiar with the knowledge. This also helps you develop a ‘big picture’ in your mind to network the knowledge you have acquired, especially when you do a lot relevant readings. 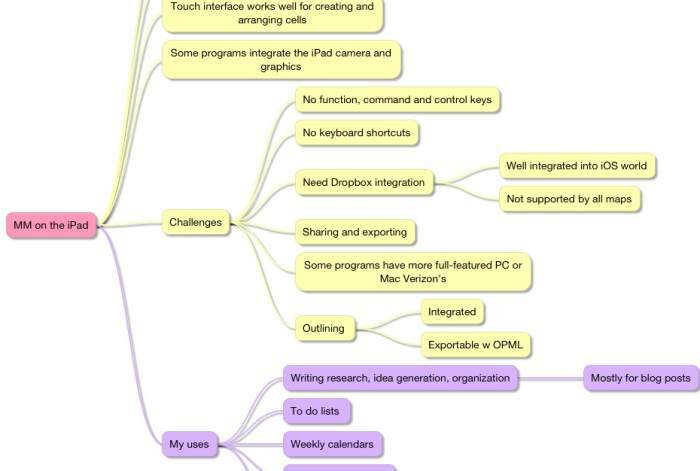 I recommend you Microsoft OneNote as a tool to take your notes down in company with a mind-mapping tool. On the Microsoft OneNote you can create your own notebooks with as many sections as you need. You can further type what you want to note and use various types of symbols to label your texts when needed (see the image below). Use your own language to write something down according to your understanding of the reading material. Then you can attach the corresponding original texts beside your own words to help you easily refer to as evidence. When you have done a lot readings which are focused on the same theme or topic, you can then consider creating a mind-map to compare your notes that are extracted from difference sources and find out the associations, relationships or links across each other. Good mind-map software I can recommend to you include: XMind. iThoughts (sample mind-mapping demonstration shown below), iMindMap. Lucidchart. These are not only my recommendations but also recommended on the internet. At the end, I really hope your assignments and your study next semester will go well. I believe you will be able to tackle all the problems you have now by carefully taking into account the techniques we are talking about today. A 2 week break out of the 4 week Christmas vacation makes up less than 4% of the whole year. Yup, that’s right! So, spending that time with family and friends without worrying too much about upcoming exams would be fair. I realise that this is not applicable to everyone. If you can only feasibly take a few days or even a week off, that’s even much less than 4% so it is well worth savouring that time and making the best of it. Besides the above, there are a few other reasons why unplugging for the holidays can be great for you. You can get back to studying for exams refreshed and raring to go. Of course, this a double-edged sword – you may feel like you want to take a much longer holiday than you had planned. A good way to get ahead of this is to sign up for one of our Exam Revision Planning workshops that can help you get a head start on how you will approach your revision after your time off. This way, you’re less inclined to procrastinate because you already have a solid plan. A break also puts everything in perspective. If you’re having a not-so-great semester because of academic or personal reasons, spending some time with your loved ones can help you feel better and realise that although doing well in university is important, you have other things to be thankful for and celebrate. Maybe it’ll give you just the right boost of optimism to get a lot of work done afterwards.